Thanks for the cards people, even the rude ones. Bill Gates is a rich bloke. In fact there must be lots of people with more money than me. I've even heard that there are some men who are better looking (never seen one, but you do hear stories). Well, I hope all these richer and better looking people have birthdays as least half as good as the one I've just had. Perfect weather, family and friends round, BBQ in garden, Apples to Apples to finish off. The best times. Thanks for coming people. 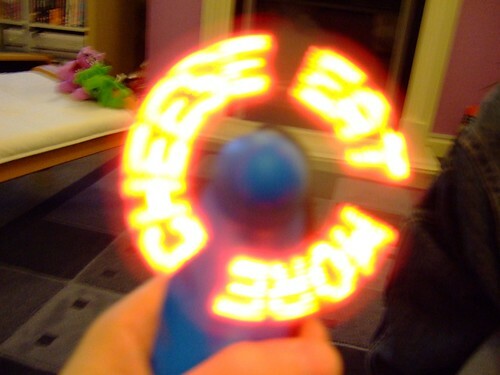 Number one daughter got me this fan you can program to display important messages. And I got a flying saucer.